The Wolverine State packs in plenty of fantastic wilderness into its mitten, but you’ll find the best outdoor adventures in another part of the state. Upper Peninsula Michigan State Parks offer guests a wide variety of experiences and landscapes to explore. You can see everything from a secluded island off the coast of Canada to a peaceful natural spring in the middle of a forest. If you need a trusty guide to help you discover the best things to do and places to see across our great state, request our free Michigan Vacation Guide! The crown jewel of this incredible Michigan State Park in the Upper Peninsula is undoubtedly the breathtaking series of waterfalls. Tahquamenon State Park is perfect for kids and adults of all ages and abilities due to the easy access, especially to the lower falls viewing deck. You can take a ferry to an island that splits the Tahquamenon River where you can see the lower and upper falls that make up the second largest waterfall east of the Mississippi River. A day of exploring Porcupine Mountains Wilderness State Park is the ultimate UP Michigan adventure! Waterfalls, lakes, rivers, ski areas, and miles of trails await you in this 60,000 square acre outdoor paradise. Hiking is the best way to explore the Porcupine Mountains, especially during Autumn when the layers of brightly colored leaves provide a beautiful canvas across the treetops. If you’re searching for scenic lookouts, the Lake of Clouds Overlook offers stunning views of the park. Fayette Historic State Park is home to a 19th-century iron smelting town on a peninsula jutting out into Lake Michigan. Twenty historic buildings make up this beautiful location that has picnic spots, a boat launch, and a visitor center. You can even go scuba diving in the harbor during certain times of the day! If you love watersports, then Pictured Rocks National Lakeshore is one of the best places to experience one of the most unique shorelines in the country. This Upper Peninsula Michigan State Park runs in between Munising and Grand Marais and features a series of odd rock formations, cliffs, and caves. Kayakers and paddleboarders can navigate through these rock passages during warmer spring and summer months. But in the winter, there are still a variety of activities that present just as much fun! Ice climbing, cross country skiing, and ice cave exploring are all fun ways to see and experience Pictured Rocks National Lakeshore! The main draw of Straits State Park is the fantastic views of Lake Huron, the Mackinac Bridge, and Mackinac Island. This Upper Peninsula State Park is the perfect place to pack a picnic lunch and enjoy a beautiful day on the shore, watching cars ride over the enormous bridge and taking in the Michigan sunshine. Isle Royale National Park may not connect to the UP, and it may be a step above a State Park, but it’s the ultimate place to disconnect from the hustle and bustle of everyday life. It lies off the coast of Canada and is only open from mid-April to the end of October and visitors. Hiking, kayaking, and wildlife viewing are the main ways to see the beautiful cliffs and thick forests around the island. Palms Book State Park is home to one of the most beautiful natural sights in the state of Michigan (and that’s saying a lot). Kitch-iti-kipi is the largest freshwater spring in the state, clocking in at 40-feet deep and spanning 200-feet across. You can take a “self-guided tour” across the surface of the crystal clear water on an observation raft. You’ll see plenty of fish, ancient tree roots, and more in this peaceful Upper Peninsula Michigan State Park. Explore our array of vacation rental homes around Michigan’s Upper Peninsula! Each of our properties allows you to get out and see the top state parks in the UP while providing you with a place to relax and recuperate for your next big adventure! Check out our UP things to do page for more great places to see in the area! Ready to plan your trip? 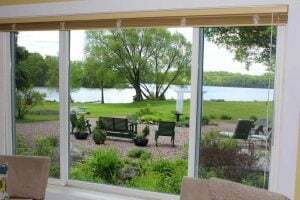 Book your Freshwater Vacation Rentals home today! We look forward to meeting you!